AfroM of AfroMusing asked me to compile the feedback on the technical questions she received from ExpLAN Computers Ltd. on their SOLO computer project. I also tossed in some questions to inquire what this is all about, and – apart from all those juicy details that we are now supposed to blog – Paul Richardson of ExpLAN Computers Ltd. not only answered these questions but also presented us with a very comprehensive understanding of how things work out in field. In other words: the man knows what’s needed and has spent an enormous amount of time trying to understand what works and what doesn’t. This is about hardware and software playing together, understanding what ppl out there really need in terms of basic computing and having an understanding for the context under which these developments are to be seen. Rechargeable Batteries: The Solo computer (Solo) will be run using a separate power-supply in a box with high-temperature rechargeable cells, capable of receiving charge up to 70degC. Also in this box is a processor and charge-switching system. 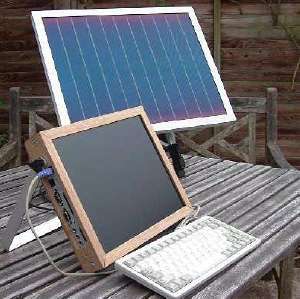 The power supply monitors what is needed to run the computer and will make up any deficiency in direct solar-power by mixing in some charge stored in a battery. Hence, you would typically have enough energy in a completely full unit to run a Solo computer for about 2.5 hours. CPU: We are no longer expecting to use the ARM-7500 processor in the production units. ARM processors are mostly used in portable devices like mobile phones, and consume less than 0.5 watts. Frankly a USB port uses more power than our processor! A pentium processor consumes typically 70watts or more. The AMD Turion processor was designed for use in low-energy laptops and is available in versions using 35w or 25w. resistive (4-wire or 5-wire). These have the active surface on top and can be scratched by dirt on a finger or stylus. capacitive.These have the active layer underneath, but can only use a finger because it needs the human body to drain the capactive charge. The problem with this is that genetics has dictated that the average African finger is 50% wider than the average European one! So Africans using capactive screens often complain that they can’t see the pointer! Surface Acoustic Wave. There is no touch-sensitive surface. Instead there are sensors at the edges of the screen which detect where a finger, stylus or stick is pointing. SAW screens are about twice the price of a 4-wire resistive. Maintenance costs: will there be any local dealers that could repair these computers when they brake? We do not expect Solo computers will be sold by the usual concept of a “dealer”. No existing dealer could yet handle the sort of technology inside a Solo, and most will be based in cities or towns that have some mains electricity. So they have the wrong skills in the wrong place! The Solo design incorporates a number of redundancy features. So if the keyboard breaks then you can use the mouse with an onscreen keyboard or a touch-screen to send a message asking for a new keyboard. Since there are no internal moving parts and very few connections, it is difficult to think what a service-engineer could repair “in the field”. If there is a catestrophic failure caused by (for example) dropping the screen on a rock, then only a Manufacturing Base or a designated field-agent could possibly be able to install a new screen. Operating Systems: Currently our prototypes are running *both* Debian Linux and RISC OS. They are both standard operating systems with the usual 7-layer model of network protocols, and based on the Berkley network stack. If the computer is running Linux, then the user environment would look no different to any other PC or laptop running the same version of Linux. The Solo is a “full” computer, not a palmtop with a cut-down functionality and reduced user-interface. The same would be true if it ran RISC OS. The Solo design does not have the usual concepts of a single hard-disc and a single block of RAM. We have a 5-layer memory system wich has different types of solid-state memory, which use different levels of power. Hence we have no concept of the computer being “off”. It simply transfers data into an appropriate type of memory and shuts off all user-processes. We expect that most Solo computers will be manufactured with two or more externally-available memory slots capable of taking a Compact Flash card, microdrive or other type of solid-state device. If the user wants more storage, then they can insert a larger media-card. the invention? : Hopefully the average user will be totally unaware of “what theinvention is”! They should just regard it as a standard computer in a slightly unusual wooden case. We’ve spent the last 8 months with one programmer working on the code to drive the video-output stages. Low energy CPUs are usually designed to drive a screen the size of that on a mobile phone. They have neither the resolution nor the data bandwidth to address a full-size computer screen. So this is an extensive amount of development work. What else could be made of wood or sustainable materials despite the computer case?The case of the Solo power-supply can also be wood. And we’re working on a solid-state light which might use wood too. However, a more important environmental issue is the use of lead and tantalum in the manufacture of circuit boards. There are no restrictionson this in countries of the Developing World. But in Europe it is now illegal to throw away such computers into a land-fill site. drinking water. Compared with that problem, the use of environmentally-friendly wood in the case of the Solo is very much a side issue. ==> that was my initial question, not the use of environmentally-friendly wood but getting this cradle-to-cradle design to the PCB level and finding a solution to this bugging issue of heavy metals pollution in the developing countries which needs to be addressed much more. Surely, finding a solution to this situation isn’t the duty of engineers that are trying to build a computer for these countries, but still, it’s the most interesting part for me. I think we’ll need a free Wiki on the inet for intelligent materials pooling – an overview of materials, availabilities and pricing that could provide some solutions to the lead, tantalum & Co. material flow management. Hello, I’m an italian journalist and I would like to know something else about solo computer. I’d like to write an article about it but I need some explanation, do you know the email address of Paul Richardson? I need to know when he is going to implementen and finish solo computer.